The property is family run & has that homely feel about it. From the second Maria collected us from the port she gave us a small guide of where to go & what to see while we were there. Anna her mother saved us on the day of our friends wedding by very kindly driving us around to get everything done in time so we would not be late. They are both wonderfully kind people & made our stay so relaxing & fun. Very clean and well kept. Room was immaculate as was the pool area. Nice location, rural but 10 min walk to beach/bus/restaurants/shops. Can feel long in the heat. Children had their own beds. Pick up and drop off to and from port from Maria’s husband who was very friendly. Everything was lovely. All the staff were extremely kind, friendly and efficient. Maria is an excellent hotelier. 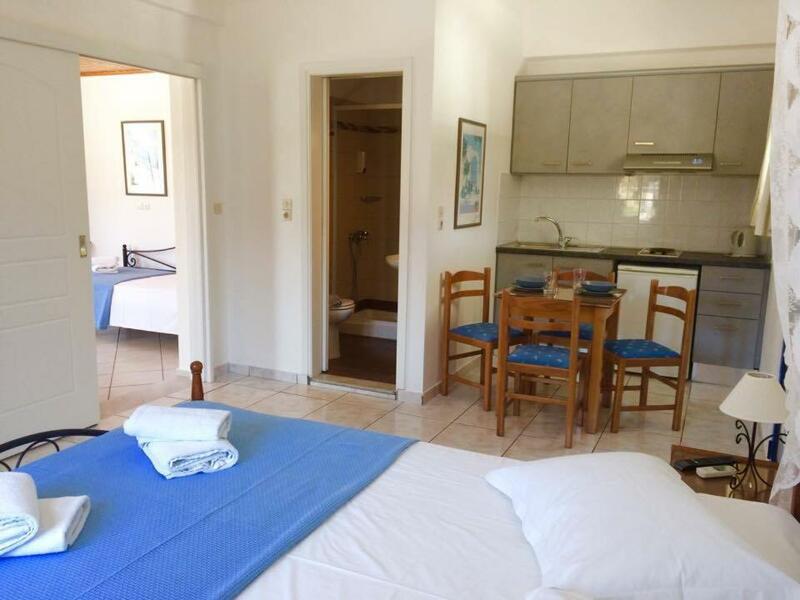 Location is good 10-minute walk to Mylopotas Beach. Pool was nice 2m depth but it has a smaller pool for kids. The rooms were very clean and spacious. 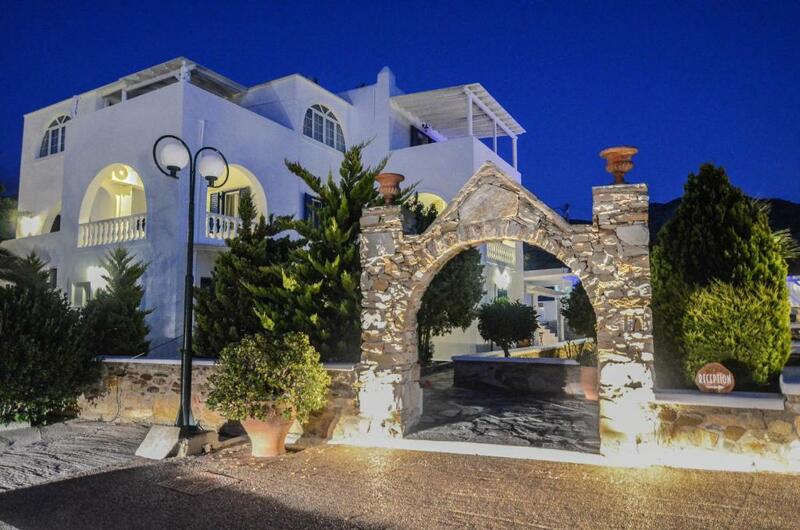 Friendly owners who happily pick us from the port and transport is to the villa at no extra cost. They also booked us the taxis for the return to the Port on our check-out day. Also the owners gave us recommendations for taverns. 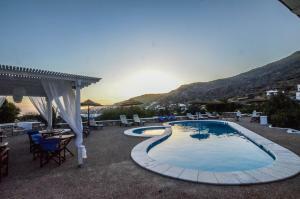 In general it was a very pleasant stay and we would prefer it in case we go to Ios island again in the future. Great family run apartments. The rooms and pool area were extremely clean. The location is only short walk to the beach front. The owners really added to the experience, all in all a great stay and i would return. The owners are incredibly lovely and offered free rides to/from the port. The breakfast is good value. The room is modern and tidy with a great air con and it is cleaned daily. Each room has a very sweet outdoor sitting area. The pool area is divine. Quiet and peaceful area. You get far more than what you pay for!! The family running the hotel were great! Overall friendly, kind and helpful. Answered any queries we had. They dropped us to the port which was great. The pool area was lovely. Location was good only a short walk to the beach. Lock in a great price for Villa Anna Maria – rated 9 by recent guests! 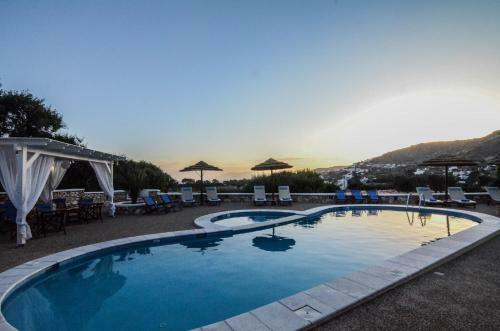 Located in a distance of 1,650 feet from Mylopotas beach, the family-run Villa Anna Maria provides quiet and peaceful self-catering accommodations in Ios. Guests have access to a pool with a separate children’s section. The air-conditioned Anna Maria studios and apartments open out to a balcony with views over the pool and the garden, while some also overlook the sea. They all come with a kitchenette with dining area, flat-screen TV and a bathroom with hairdryer. Breakfast is served daily at the pool area, upon charge. Refreshing drinks, fresh juices and snacks are served at the on-site pool bar. Free WiFi is provided. There is also a private parking area, reserved for the guests of the property. 뀐 Located in the top-rated area in Mylopotas, this property has an excellent location score of 8.7! When would you like to stay at Villa Anna Maria? Kindly note that guests under 21 years old cannot be accommodated without a supervisor. Please note that 1 child under 2 years old can be accommodated free of charge in a baby cot. Please consult the children policy for extra charges regarding children using the existing bed in the room. Located on the ground floor, this studio features a furnished terrace with garden views, electric kettle and air conditioning. This apartment has a kitchenware, air conditioning and patio. Villa Anna Maria studios is a small property of 6 studios & 4 apartments suitable for families and couples who are looking for quiet and relaxing holidays. Ο καμπος του Μυλοποτα ειναι μια αραιοκατοικημενη περιοχη καταλληλη για οικογενειες και ζευγαρια που ενω θελουν να ειναι κοντα στην παραλια, θελουν ταυτοχρονα να ειναι και μακρια απο τους θορυβους της απολαμβανοντας την θεα και τους ηχους της φυσης που περιβαλλουν το χωρο. House Rules Villa Anna Maria takes special requests – add in the next step! Villa Anna Maria accepts these cards and reserves the right to temporarily hold an amount prior to arrival. Kindly note that reception operates from 9:00 to 15:00 and from 18:30 to 20:30. 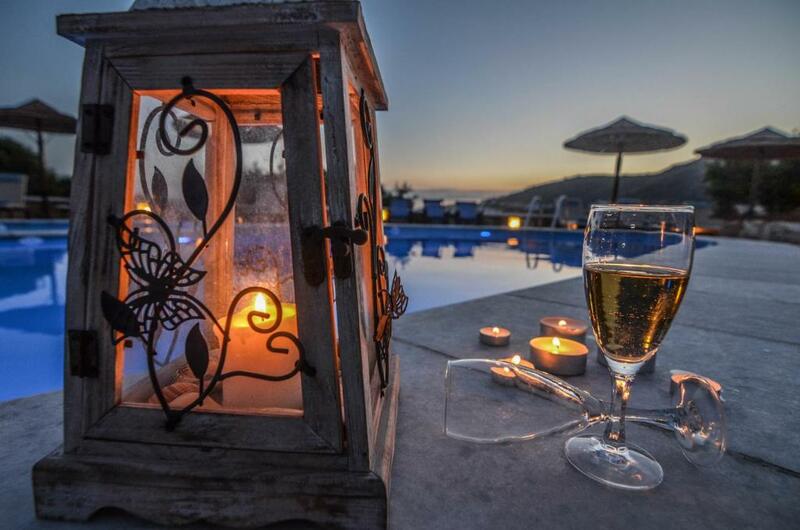 Guests arriving outside operating hours are kindly requested to contact the property. Kindly note that pool bar is open daily from 09:00 to 15:00 and from 18:30 to 20:30. Bed was rock hard, had very little sleep due to this unfortunately. It’s very quiet around the pool and I felt my children couldn’t be themselves. One guest told them to shut up, no fault of the owner, but It made staying around the pool awkward for us so we stayed away as much as possible. The reception pool bar isn’t open all that often and seemed overpriced for what you get. Not all items were available. We didn’t have much of a warm Welcome from Maria as others have said in reviews. After coming from Mykonos where the owners were so welcoming and friendly it really stuck out for us. Even more so after moving onto Santorini and having a really friendly and warm welcome. I think villa Anna Maria is more geared up for adults or people with older children really. A little soft and thin bed for my preference in room no. 5. Tiny shower in one of the rooms (no.5), the other two rooms we booked had spacious bathrooms. The walk up from the beach felt long in the heat but it is only 10 minutes. Minor con. Anna and Maria were extremely friendly and welcoming. Quiet, clean and beautiful place ! I recommend it for everyone ! Very accommodating, made us feel so welcome. Transport available to and from port which was extremely useful. Very quiet area, beautiful pool & great views, within walking distance to the amazing beach (water crystal clear). Maria & her mum are lovely & go above and beyond to make your stay the best. Great value for money. Definitely recommend for families & couples. Beautiful pool area and clean modern rooms. No complaints - exactly what I had hoped for, very relaxing! Maria was very helpful and organised - went out of our way to make sure we had a great stay. The pool is gorgeous - short walk to the beach - perfect place to relax and unwind, but still close enough to the beach to visit restaurants, hit the beach bars and use public transport to enjoy Ios' famous nightlife. Would stay again!